Eco-friendly furnishings and appliances have become wildly popular in the world of interior design, so it's not surprising that many individuals are incorporating these aspects into their bathrooms. 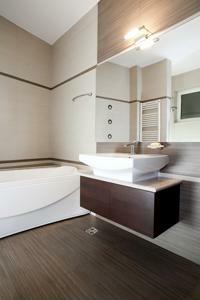 According to GreenerIdeal.com, the following bathroom accessories and tips will help save you money and limit your impact on the environment. A high-efficiency toilet should be one of your top priorities - since old style toilets waste nearly seven gallons per flush, this is money that is literally going down the drain. A high-efficiency toilet typically uses between 1.6 gallons for a full flush and 0.8 gallons for a reduced one. This can dramatically reduce your water usage and you'll see the difference in your utility bills. Window treatments are often overlooked in a bathroom, but they can make a huge difference in your heating and air conditioning costs. Opt for a cellular shade that will limit the amount of air leakage escaping to the outdoors and control the light filtering in the space. Going green in your bathroom is a lot easier than you may think, and you'll be helping the environment as well as reducing your monthly expenses. What green upgrades do you suggest during a bathroom remodeling project?